The garages and junk drawers of America are full of tools that rarely get used. Many a spouse wonders why their significant other keeps insisting on buying yet more tools seemingly to just put them into storage next to the ones that came before. At first glance this behavior seems outright mad. Upon closer inspection, however, it turns out that excessive tool hoarding is a simple shopping addiction. We all enjoy shopping. We just like to buy different things. Cars, clothes, boats, tools and gadgets of any kind are a perennial favorite. The rush we feel feel when having the latest power tool is not unlike what any other shopaholic feels when getting their hands on new merchandise. These feelings are not evil; they are just a fact of life, and a source of a lot of joy we all can experience equally. By association, the tool hoarder is not evil or doing it to spite you. The collector is just acting out his or her normal desires. 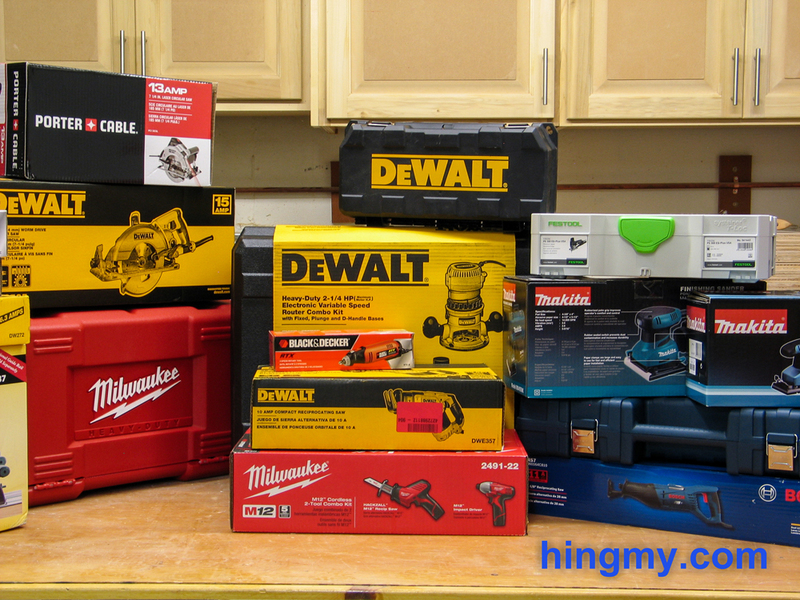 Tools are just one particular item a shopaholic goes for. They are no more desirable that the next thing. If you cut that avenue off, all you will accomplish is shifting his or her focus onto another object of desire. Doing so not only creates unnecessary strife, but also does not fix the underlying issue. Your are up against human nature. Any approach you take must consider the fact that you are dealing with a human being; faults and all. The first and most important realization you have to come to is that buying tools makes a very important person in your life happy. That's not such a bad thing in itself, is it? As long as he is not putting financial pressure on your relationship by being a shopaholic, you should be happy that your loved one has a hobby. You should let him or her have their fun. Instead of trying to curb the collector's tool buying, concentrate on guiding your partner and helping him or her be a better provider. Think of tools not as objects, but as a capability. With a tool a person can build projects that are useful to you. Your strategy should be to suggest new projects you'd like to have built around the house. Choose whatever you like. A lot of DIYers are not particular about what they build. They just want to play with their tools. Use that to your advantage. The benefit of this strategy not only manifests themselves in projects getting built, but also in a better relationship. Partners have a natural need to provide for each other. In today's world of the double income family this is becoming harder and harder to do. Giving your partner a chance to build something satisfies that need, and gives you the feeling of being cared for. It's a win-win scenario. The high your partner gets from being a successful provider will slow down his or her tool buying habit. The only rule you really need is limiting tool purchases to the tools necessary to complete a project. That way your partner has to finish the current project, if he or she wants to buy more tools. Consistently finishing projects, however, can be hard for anyone. So don't insist on this rule in all circumstances. Sometimes it's better to help your partner get over the hump. You might have to do some work yourself to get some momentum going, but the effort will be well worth the domestic bliss it creates. DIYers often collect tools out of the simple desire to feel the shopping high. Simply cutting them off will not stop the behavior. The hoarder will shift his or her focus onto other things. The winning strategy is one of motivating your partner to use the tools he or she purchases to build projects for both of you around the house. This will give your partner an opportunity to provide for you, and feel the emotional high that is associated with it. Limiting tool purchases to the tools needed for the next project creates a limiting function that helps your partner shift his or her focus from simply buying tool, to creating and providing for their family. Taking the positive approach not only gets you new stuff around the the house, it'll also create a better relationship with your partner.